Look at that. 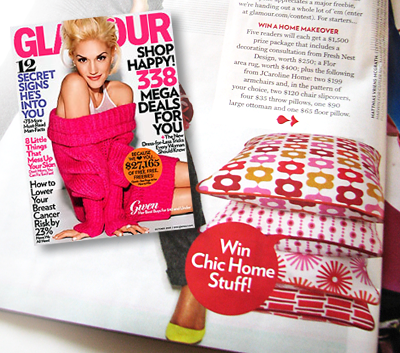 My fabric has made an appearance in the October issue of Glamour. Right next to Gwen Stefani. Or, well, 46 pages past the cover that features Gwen Stefani. Same difference. Actually the photo announces a room makeover that five Glamour readers can win. Each package includes a Fresh Nest Design decorating consultation, a Flor area rug, two armchairs, chair slipcovers, ottoman, and pillows from your choice of fabrics at JCaroline Home, a $1,500 value. Enter here! You have read this article giveaway / press with the title Win a room makeover. You can bookmark this page URL http://jenkrebs.blogspot.com/2009/09/win-room-makeover.html. Thanks! No comment for "Win a room makeover"